To make the compote, add the berries to a saucepan and turn the heat to medium low. Next, add the sugar and bring the berries to a gentle boil. Stir occasionally and let simmer for approximately 5 minutes. In the meantime, add the water to the cornstarch and mix together to dissolve. Next, bring the compote to a gentle boil and slowly add the cornstarch until you reach the desired consistency. The compote does not need to be too thick as it will thicken even further as it cools. Let the compote cook for about 5 minutes on low heat to cook out the flavor of the cornstarch. Begin by mixing together the flour, baking powder and salt. Whisk together the eggs, vanilla and almond extract. Whisk in the milk, followed by the dry ingredients. 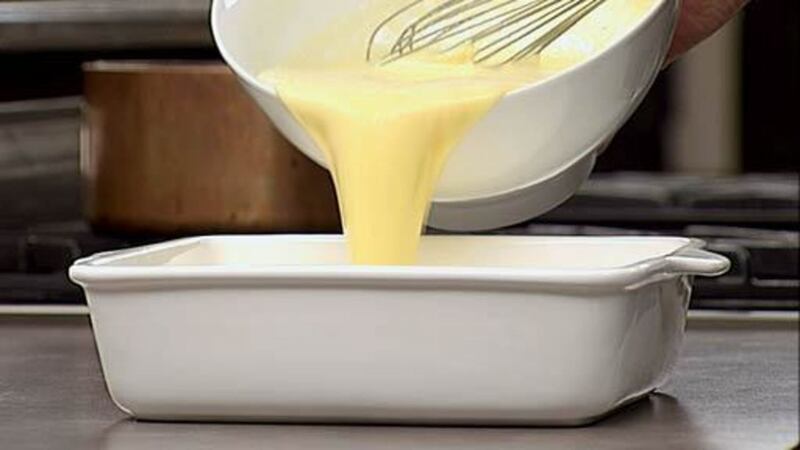 Pour the mixture into a dish large enough to hold a few pieces of bread at a time. Cut the day-old bread into thick slices. Turn the heat to medium-high and lightly oil your griddle or fry pan. Soak the bread in the egg mixture for a minute or two, or just until bread is soaked through. 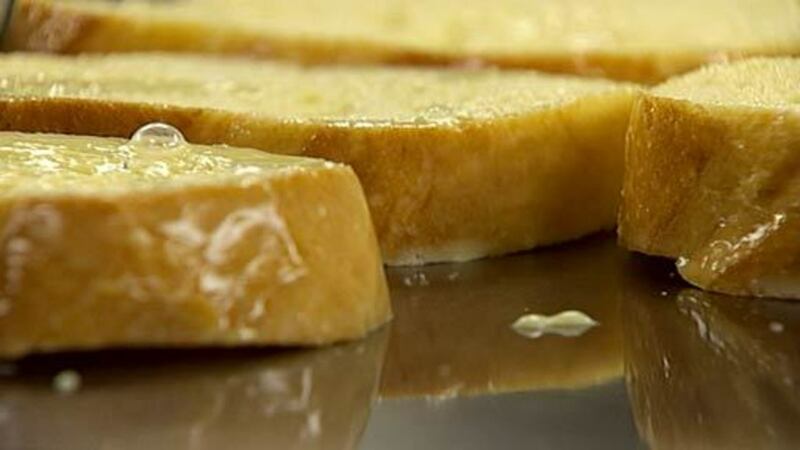 Cook the French toast on each side for about 3 to 5 minutes or until bread is golden and cooked all the way through. The centre should no longer be eggy and wet. Serve with the warm berry compote. Using flour and baking powder makes the french toast almost soufflé-like. The berry compote can be prepared in advance. When I made this one morning, I had some nice soft Japanese bread (*shokupan) that a friend and I used for the french toast. Shokupan is thick-sliced and extremely slight and sweeter than North American bread. The results?...delicious. Good enough to have as a dessert. Actually, next time I'm gonna eat this with vanilla ice cream. Although the name of this recipe is Cinnamon Almond French Toast, cinnamon is nowhere to be found in the ingredients. Cinnamon is something that I usually add to this French toast, at least when I serve it with maple syrup instead of the berry compote. But I have to give you two points for that catch...thanks! 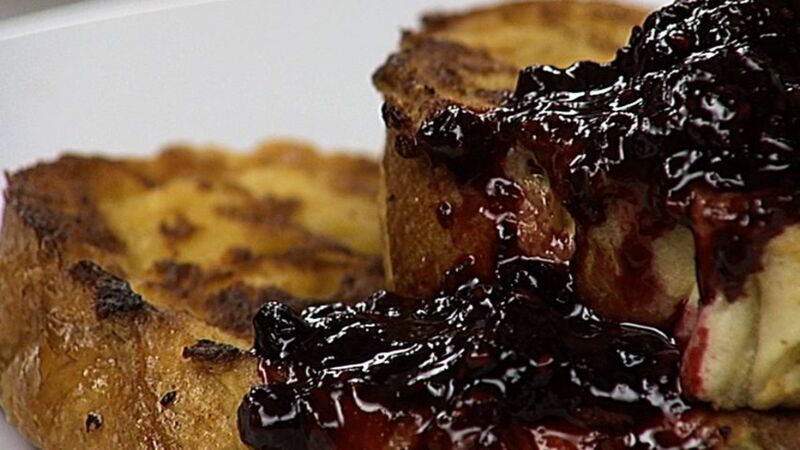 Hi I would like to serve this dish without the Berry Compote, but I also like my french toast sweet, is it possible to add sugar to the ingredient list, if so how much? If you are using maple syrup, I don't think you need to sweeten this at all. However, if you would like to sweeten the French Toast themselves, I'd simply sprinkle granulated sugar on the top after cooking. Dawn used to squeeze lemon juice and sprinkle with sugar and it was great. Hi, Simple question, what is the purpose of the flour/baking soda mixture added to the egg? I was just at a French Pastery Store and the chef didn't mention this step to me. I've seen on cooking shows to dip in flour then egg so the egg binds to the bread, but I'm confused on mixing it in. It's my wife's bday tomorrow and she's requested French Toast! :) Btw, the berry compote looks great, I'm gonna make it tonight in advanced! Cheers! Though it is optional, baking powder was added to provide a bit of extra leavening. This helps the French toast to puff up and makes it a tiny bit souffle-like. Cheers! Hey there, Thanks for the tip, I made the French Toast as directed and it was a hit! I also made the fruit compote, along with a home made caramel recipe I read on the G&amp;M website (Michael Smith) and that turned out fantastic too. Your techniques through the various videos about monitoring temperature, using a proper simmer made all the difference! Excellent breakfast and I've never even made French Toast! Thx! I don't have any corn starch at the moment and I was wondering if I could use flour or another ingredient in a pinch. Here is a good site that has substitution recommendations. You cannot substitute regular flour for cornstarch when making compote. It will taste and look awful. You can try using arrowroot or tapioca...but I imagine if you don't have cornstarch, you likely won't have those other two. It's best to wait until you have one of these thickeners to make the compote. Alternatively, you can cook the fruit without the thickener but it just won't be as thick. Cheers! sifted dry ingredients and still wound up with lumps in batter. Is there a technique that can eliminate that or was it to be expected? There should not be large lumps in the batter, small lumps are OK and will cook out. While whisking, perhaps try adding the flour in a bit at a time (as per the video). Cheers!